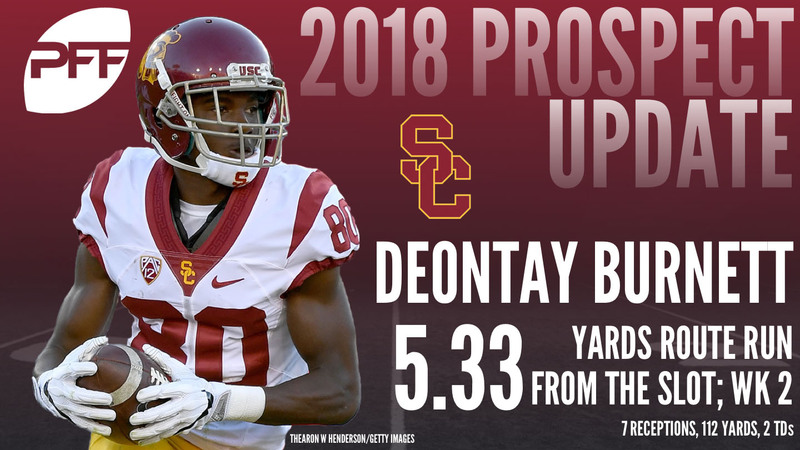 Each week at PFF, we’ll break down the previous weekend’s slate of college football games, with an eye towards the 2018 NFL draft including those players featured in the PFF Preseason Draft Guide. 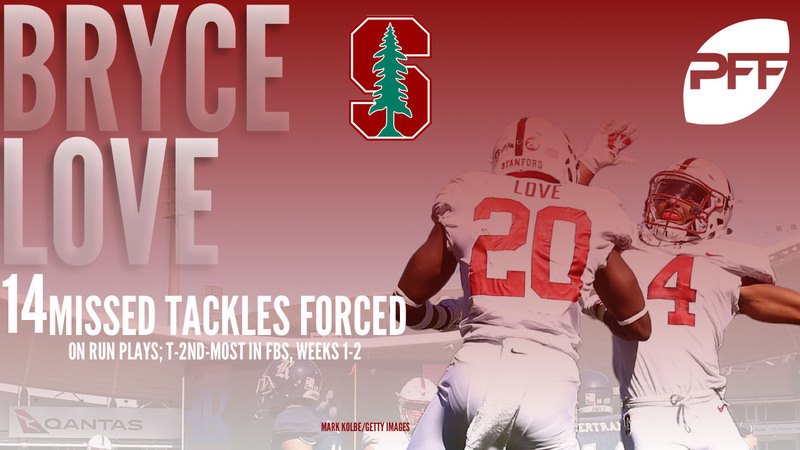 Only two games into the season and Stanford running back Bryce Love is tied for second in the nation with 14 missed tackles forced on only 30 carries. He’s been a big-play threat for Stanford with runs of 62 and 75 yards under his belt, and he’s averaging a gaudy 11.3 yards per carry. Love was pegged as a breakout player prior to the season. While USC QB Sam Darnold receives most of the hype, WR Deontay Burnett deserves plenty of attention as well. He’s been Darnold’s go-to guy in the early going, catching 16 passes for 263 yards (16.4 yards/reception) and he was outstanding against Stanford with two touchdowns, including one diving catch, and four missed tackles forced. 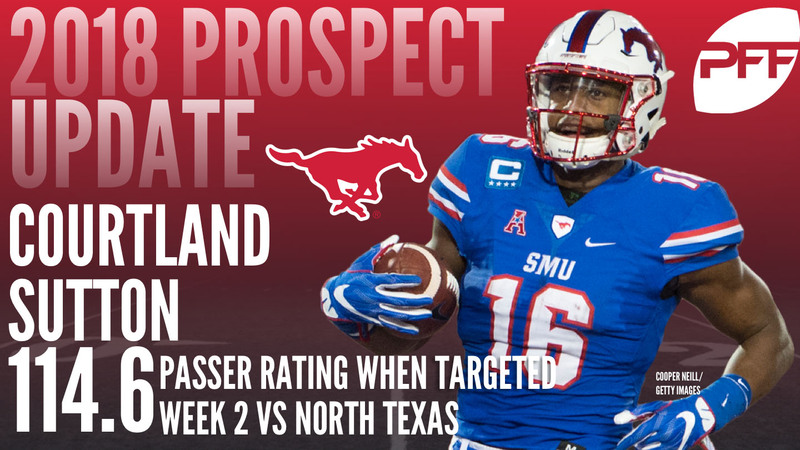 SMU’s Courtland Sutton found the end zone four times against North Texas, showing off a diverse skillset. He broke a tackle and broke away from the defense for his first touchdown before using his big frame to win at the catch point on a go route and end zone fade for his next two scores. Sutton’s last touchdown was a gimme on a busted coverage, but it doesn’t take away from a fine night as he looks to be the top receiver off the board in 2018. 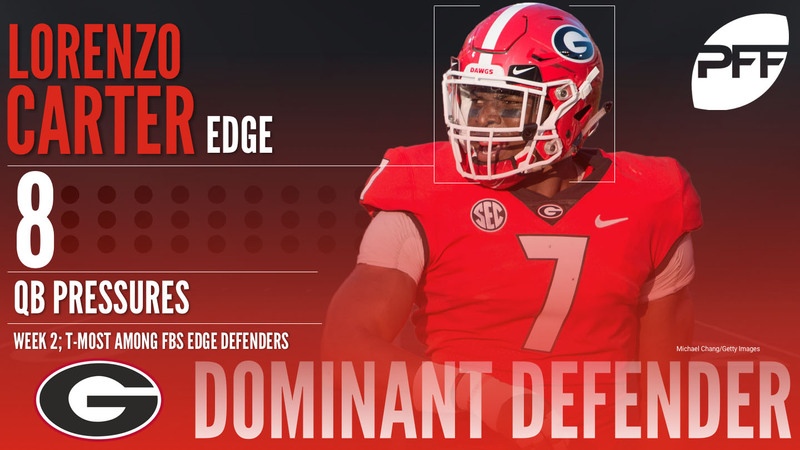 We highlighted Notre Dame offensive tackle Mike McGlinchey’s matchup with Georgia edge defenders Lorenzo Carter and Davin Bellamy leading into the game and it was the Bellamy in particular who gave McGlinchey issues. Bellamy picked up a quick pressure in the third quarter, getting to the quarterback in about two seconds, then duplicated the same move to seal the game with a strip sack. McGlinchey was charged with one other pressure on the day and he didn’t have the same kind of dominant effort in the run game that we’ve become accustomed to seeing and his 51.3 overall grade is his worst since Week 9 of last year against Miami. While the opposition hasn’t been great for Wisconsin right tackle David Edwards (Wisconsin has played Utah State and Florida Atlantic), he’s showed well with his powerful run blocking at the point of attack. If facing lesser competition, it helps to make it look like a high school game, and that’s what Edwards has done, destroying defenders and creating high-school-like holes in the run game while allowing only one pressure on 59 attempts. We’re looking forward to seeing if the improvement is just a mirage as he graded at only 42.1 overall last season. We have to highlight Georgia’s Lorenzo Carter and Davin Bellamy who both stepped up on the big stage against Notre Dame. Carter is a former top recruit who came into the season with only 48 career pressures in his three years. He’s already picked up eight pressures in two games (one sack, one QB hit, and six hurries) including two forced fumbles against the Irish. Bellamy has had a similar career, solid yet unspectacular, but perhaps his game-clinching sack against McGlinchey is a sign of bigger things to come. Both Carter and Bellamy have classic NFL 3-4 outside linebacker size with Carter listed at 6-foot-6 242 pounds and Bellamy at 6-foot-5 240 pounds. USC has a pair of defenders making noise in the early going in edge Uchenna Nwosu and DI Rasheem Green. Both players were outstanding against Stanford with Green picking up two QB hits, two hurries, and a batted pass while Nwosu had an incredible five QB hits, one hurry, and three batted passes on only 24 rushes. Both players combined to supply 10 of USC’s 14 pressures on the night. In perhaps the best game by a cornerback since PFF college grading started in 2014, Western Michigan’s Darius Phillips actually improved upon his strong Week 1 outing against USC. Phillips was targeted five times against Michigan State, breaking up four passes and intercepting the other while also returning a kick for a touchdown, his second in as many weeks. Phillips is very much on the radar as a prospect for the 2018 NFL draft. Iowa cornerback Joshua Jackson burst onto the scene with a pass breakup and an interception in Week 1 against Wyoming and he followed up last week with four more pass breakups. He’s still given up 131 yards on 12 receptions into his coverage through two games, but at 6-foot-1 and impressive ball skills, Jackson has turned heads in his first extended college action. 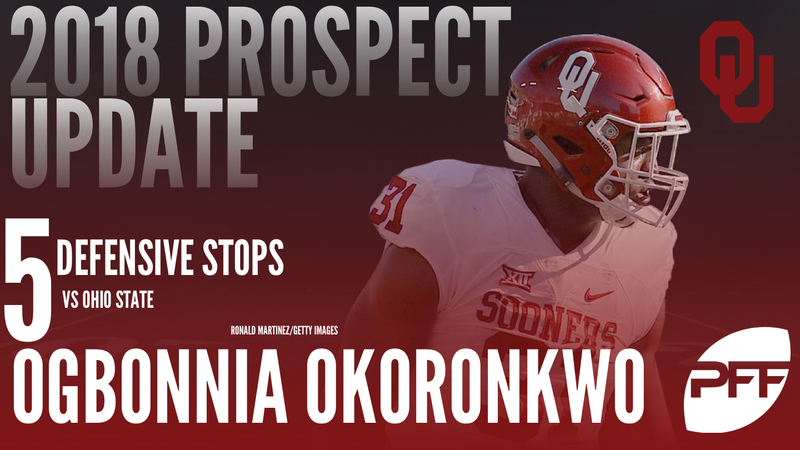 Oklahoma edge defender Ogbonnia Okoronkwo stepped up on a national stage with two sacks against Ohio State.